DARMSTADT, Germany — After making history Wednesday as the first spacecraft to touch down on a comet, Europe’s Philae lander collected data on the rugged alien world’s environment and may have rebounded into space before settling back on the surface, scientists said Wednesday. The small landing craft deployed from the European Space Agency’s Rosetta spacecraft Wednesday to begin a seven-hour descent to the comet. Tension grew inside ESA’s operations center here as the expected time of touchdown approached, and views inside the Rosetta mission control room showed engineers with strained faces waiting for radio signals confirming the lander had reached the comet. The dramatic space gymnastics all occurred at comet 67P/Churyumov-Gerasimenko, a bizarre object orbiting the sun more than 300 million miles from Earth. The comet’s tenuous gravity field is one hundred thousand times weaker than Earth’s, and officials worried the lander could bounce off the comet with little pull to hold it on the surface. 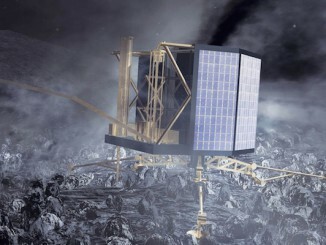 Philae flew with a top-mounted cold gas thruster to fire and keep the probe on the surface while it engaged harpoons and ice screws to anchor it to the comet. But at least two of the landing assist devices did not work. 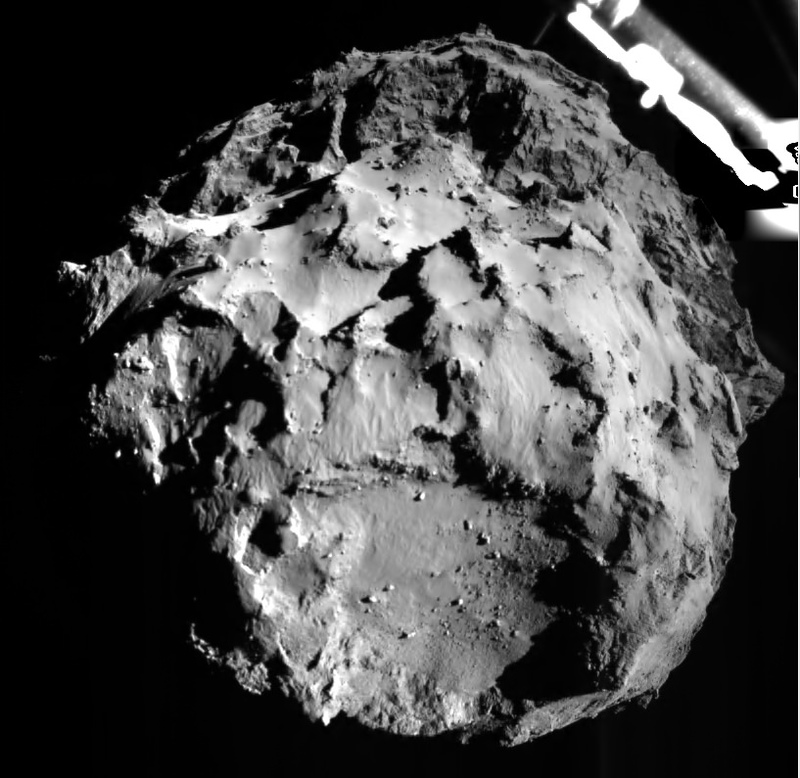 The thruster system failed to pressurize during lander preparations Tuesday night, and officials said Philae’s two harpoon anchors did not fire when the craft reached the comet Wednesday. Officials could also not definitively confirm whether the ice screws bored into the comet to keep the lander on the surface. Ground controllers received the initial notification of Philae’s landing at 1603 GMT (11:03 a.m. EST), triggering an immense emotional release and a wave of cheers and applause. The status of the lander was put in doubt a few minutes later after a manager from Philae’s control center in Cologne, Germany, reported the craft apparently did not fire the harpoon anchors as planned. “What we know is that we touched down, so we landed at the comet at the time when you all saw us cheering, when it was announced we had a very clear signal,” said Stephan Ulamec, manager of the Philae mission for DLR, the German Aerospace Center. 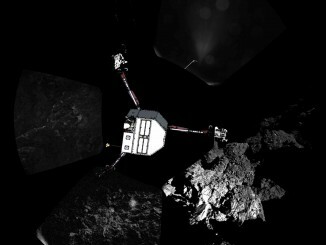 Ulamec said Philae transmitted information on its status, and at least some of the lander’s 10 science instruments collected data and delivered the results to Earth. Engineers say they saw fluctuations in the radio signals from Philae being relayed by the Rosetta orbiter, which carries a more powerful communications system. Cautioning his statement as speculation, Ulamec said information received from Philae is consistent with the lander moving across the surface after its initial contact with the comet. “Some of these data indicated that the lander may have lifted off again,” Ulamec said. 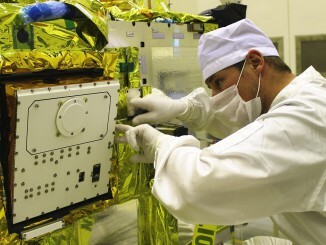 Data signatures from the lander also showed changes in power being generated by solar cells covering the craft’s outer skin, “which could be interpreted that the lander lifted off and started to turn itself because flywheel (stabilization system) was switched off at touchdown,” Ulamec said. After about two hours, the fluctuations in Philae’s electrical system ceased but the radio signals continued, meaning the lander may have come to a rest. “Maybe today we didn’t just land once, we even landed twice,” Ulamec said. Mission control lost contact with Philae soon after — a little earlier than expected, said Paolo Ferri, head of mission operations at ESA. “We lost the radio link earlier than planned, which is something that we never like, but this is not at the moment concerning,” Ferri said. Rough terrain may have blocked the line-of-sight radio link between Philae and Rosetta sooner than expected, according to Ferri. Officials said the next chance to contact Philae will be around 0600 GMT (1 a.m. EST) when Rosetta again flies in range of the lander.